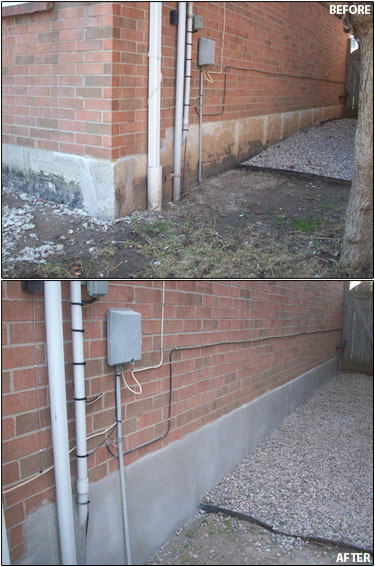 Parging is applying a strong form of cement to a wall and creating a smooth, flat wall. 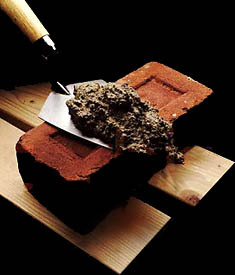 Parging is usually applied along the bottom 1 to 4 feet of a wall. In large areas, sheets of galvanized mesh are nailed to the wall then a "scratch coat" of strong cement is applied prior to the last coat, which is smoothed with a sponge-like tool to make it flat and even. Small areas of parging do not require mesh. © 2003 - 2019 Haroutunian Masonry Ltd. All rights reserved.